Five Sisters shows young African dressed woman standing in a burst of white light a top a flowing turquoise and deep blue hill. This is a high texture painting with some features embossed. Some areas of the painting were treated so that the paint would crackle. 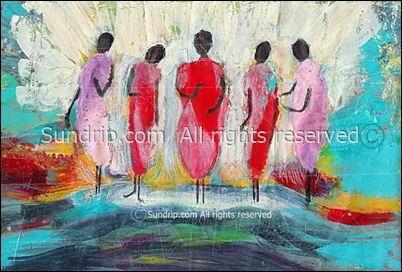 Movement, energy, womanhood and togetherness all come together in this painting called Five Sisters. Painting Details: Faceless figures in African style dress, turquoise brush strokes, gold, red, royal purple, orange, ivory white light, high texture. 8x12 textured paper, acrylic, ink, wood crackling medium, sealed, signed, mounted. I am interested in purchasing the Five Sisters Art. When is going to be available again.? This item has been sold. I offer original art in my Etsy shop with cards, small prints and other medias in my Redbubble shop. At this time, my Etsy shop is closed. I have Lupus and Fibromyalgia and have had serious health issues the last four months which required me to close my shops while recuperating. My goal is to have my Etsy shop open mid April. The print shop is always open at the RedBubble location. Please See my sidebar for the Redbubble link or click below.